Dadabhai Naoroji (4 September 1825 – 30 June 1917), known as the Grand Old Man of India, was a Parsi intellectual, educator, cotton trader, and an early Indian political and social leader. He was a Liberal Party member of Parliament (MP) in the United Kingdom House of Commons between 1892 and 1895, and the first Indian to be a British MP, notwithstanding the Anglo-Indian MP David Ochterlony Dyce Sombre, who was disenfranchised for corruption. Naoroji is also credited with the founding of the Indian National Congress, along with A.O. Hume and Dinshaw Edulji Wacha. His book Poverty and Un-British Rule in India brought attention to the draining of India's wealth into Britain. He was also a member of the Second International along with Kautsky and Plekhanov . In 2014, Deputy Prime Minister Nick Clegg inaugurated the Dadabhai Naoroji Awards for services to UK-India relations. India Post dedicated a stamp to Naoroji on 29 December 2017, on the occasion of his 100th death anniversary. Naoroji was born in Bombay into a Gujarati-speaking Parsi family, and educated at the Elphinstone Institute School. He was patronised by the Maharaja of Baroda, Sayajirao Gaekwad III, and started his public life as the Dewan (Minister) to the Maharaja in 1874. Being an Athornan (ordained priest), Naoroji founded the Rahnumae Mazdayasne Sabha (Guides on the Mazdayasne Path) on 1 August 1851 to restore the Zoroastrian religion to its original purity and simplicity. In 1854, he also founded a Gujarati fortnightly publication, the Rast Goftar (or The Truth Teller), to clarify Zoroastrian concepts and promote Parsi social reforms. In 1855, he was appointed Professor of Mathematics and Natural Philosophy at the Elphinstone College in Bombay, becoming the first Indian to hold such an academic position. He travelled to London in 1855 to become a partner in Cama & Co, opening a Liverpool location for the first Indian company to be established in Britain. Within three years, he had resigned on ethical grounds. In 1859, he established his own cotton trading company, Dadabhai Naoroji & Co. Later, he became professor of Gujarati at University College London. In 1865, Naoroji directed the launch the London Indian Society, the purpose of which was to discuss Indian political, social and literary subjects. 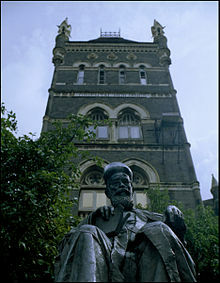 In 1861 Naoroji founded The Zoroastrian Trust Funds of Europe alongside Muncherjee Hormusji Cama In 1867 Naoroji also helped to establish the East India Association, one of the predecessor organisations of the Indian National Congress with the aim of putting across the Indian point of view before the British public. The Association was instrumental in counter-acting the propaganda by the Ethnological Society of London which, in its session in 1866, had tried to prove the inferiority of the Asians to the Europeans. This Association soon won the support of eminent Englishmen and was able to exercise considerable influence in the British Parliament. In 1874, he became Prime Minister of Baroda and was a member of the Legislative Council of Mumbai (1885–88). He was also a member of the Indian National Association founded by Sir Surendranath Banerjee from Calcutta a few years before the founding of the Indian National Congress in Bombay, with the same objectives and practices. The two groups later merged into the INC, and Naoroji was elected President of the Congress in 1886. Naoroji published Poverty and un-British Rule in India in 1901. Elected to the British House of Commons as a result of the 1892 election, he served until 1895. During his time he put his efforts towards improving the situation in India. He had a very clear vision and was an effective communicator. He set forth his views about the situation in India over the course of history of the governance of the country and the way in which the colonial rulers rules. Naoroji moved to Britain once again and continued his political involvement. Elected for the Liberal Party in Finsbury Central at the 1892 general election, he was the first British Indian MP. He refused to take the oath on the Bible as he was not a Christian, but was allowed to take the oath of office in the name of God on his copy of Khordeh Avesta. In Parliament, he spoke on Irish Home Rule and the condition of the Indian people. He was also a notable Freemason. In his political campaign and duties as an MP, he was assisted by Muhammed Ali Jinnah, the future Muslim nationalist and founder of Pakistan. In 1906, Naoroji was again elected president of the Indian National Congress. Naoroji was a staunch moderate within the Congress, during the phase when opinion in the party was split between the moderates and extremists. Naoroji was a mentor to Bal Gangadhar Tilak, Gopal Krishna Gokhale and Mohandas Karamchand Gandhi. He was married to Gulbai at the age of eleven. He died in Bombay on 30 June 1917, at the age of 91. Today the Dadabhai Naoroji Road, a heritage road of Mumbai, is named after him. Also, the Dadabhai Naoroji Road in Karachi, Pakistan is also named after him as well, as Naoroji Street in the Finsbury area of London. A prominent residential colony for central government servants in the south of Delhi is also named Naoroji Nagar. His granddaughters Perin and Khrushedben were also involved in the freedom struggle. In 1930, Khurshedben was arrested along with other revolutionaries for attempting to hoist the Indian flag in a Government College in Ahmedabad. Dadabhai Naoroji's work focused on the drain of wealth from India into England during colonial rule of British in India. One of the reasons that the Drain theory is attributed to Naoroji is his decision to estimate the net national profit of India, and by extension, the effect that colonisation has on the country. Through his work with economics, Naoroji sought to prove that Britannia was draining money out of India. Naoroji described 6 factors which resulted in the external drain. Firstly, India is governed by a foreign government. Secondly, India does not attract immigrants which bring labour and capital for economic growth. Thirdly, India pays for Britain's civil administrations and occupational army. Fourthly, India bears the burden of empire building in and out of its borders. Fifthly, opening the country to free trade was actually a way to exploit India by offering highly paid jobs to foreign personnel. Lastly, the principal income-earners would buy outside of India or leave with the money as they were mostly foreign personnel. In Naoroji's book 'Poverty' he estimated a 200–300 million pounds loss of India's revenue to Britain that is not returned. Naoroji described this as vampirism, with money being a metaphor for blood, which humanised India and attempted to show Britain's actions as monstrous in an attempt to garner sympathy for the nationalist movement. When referring to the Drain, Naoroji stated that he believed some tribute was necessary as payment for the services that England brought to India such as the railways. However the money from these services were being drained out of India; for instance the money being earned by the railways did not belong to India, which supported his assessment that India was giving too much to Britain. India was paying tribute for something that was not bringing profit to the country directly. Instead of paying off foreign investment which other countries did, India was paying for services rendered despite the operation of the railway being already profitable for Britain. This type of drain was experienced in different ways as well, for instance, British workers earning wages that were not equal with the work that they have done in India, or trade that undervalued India's goods and overvalued outside goods. Englishmen were encouraged to take on high paying jobs in India, and the British government allowed them to take a portion of their income back to Britain. Furthermore, the East India Company was purchasing Indian goods with money drained from India to export to Britain, which was a way that the opening up of free trade allowed India to be exploited. When elected to Parliament by a narrow margin of 5 votes his first speech was about questioning Britain's role in India. Naoroji explained that Indians were either British subjects or British slaves, depending on how willing Britain was to give India the institutions that Britain already operated. By giving these institutions to India it would allow India to govern itself and as a result the revenue would stay in India. It is because Naoroji identified himself as an Imperial citizen that he was able to address the economic hardships facing India to an English audience. By presenting himself as an Imperial citizen he was able to use rhetoric to show the benefit to Britain that an ease of financial burden on India would have. He argued that by allowing the money earned in India to stay in India, tributes would be willingly and easily paid without fear of poverty; he argued that this could be done by giving equal employment opportunities to Indian professionals who consistently took jobs they were over-qualified for. Indian labour would be more likely to spend their income within India preventing one aspect of the drain. Naoroji believed that to solve the problem of the drain it was important to allow India to develop industries; this would not be possible without the revenue draining from India into England. It was also important to examine British and Indian trade to prevent the end of budding industries due to unfair valuing of goods and services. By allowing industry to grow in India, tribute could be paid to Britain in the form of taxation and the increase in interest for British goods in India. Over time, Naoroji became more extreme in his comments as he began to lose patience with Britain. This was shown in his comments which became increasingly aggressive. Naoroji showed how the ideologies of Britain conflicted when asking them if they would allow French youth to occupy all the lucrative posts in England. He also brought up the way that Britain objected to the drain of wealth to the papacy during the 16th century. Naoroji's work on the drain theory was the main reason behind the creation of the Royal Commission on Indian Expenditure in 1896 in which he was also a member. This commission reviewed financial burdens on India and in some cases came to the conclusion that those burdens were misplaced. Dadabhai Naoroji is regarded as one of the most important Indians during the independence movement. In his writings, he considered that the foreign intervention into India was clearly not favourable for the country. Further development was checked by the frequent invasions of India by, and the subsequent continuous rule of, foreigners of entirely different character and genius, who, not having any sympathy with the indigenous literature – on the contrary, having much fanatical antipathy to the religion of the Hindus – prevented its further growth. Priest-hood, first for power and afterwards from ignorance, completed the mischief, as has happened in all other countries. Naoroji is remembered as the "Grand Old Man of Indian Nationalism"
Mahatma Gandhi wrote to Naoroji in a letter of 1894 that "The Indians look up to you as children to the father. Such is really the feeling here." If we twenty eight crore of Indians were entitled to send only one member to the British parliament, there is no doubt that we would have elected Dadabhai Naoroji unanimously to grace that post. Here are the significant extracts taken from his speech delivered before the East India Association on 2 May 1867 regarding what educated Indians expect from their British rulers. "In this Memorandum I desire to submit for the kind and generous consideration of His Lordship the Secretary of State for India, that from the same cause of the deplorable drain [of economic wealth from India to England], besides the material exhaustion of India, the moral loss to her is no less sad and lamentable . . . All [the Europeans] effectually do is to eat the substance of India, material and moral, while living there, and when they go, they carry away all they have acquired . . . The thousands [of Indians] that are being sent out by the universities every year find themselves in a most anomalous position. There is no place for them in their motherland . . . What must be the inevitable consequence? . . . despotism and destruction . . . or destroying hand and power. " In this above quotation he explains his theory in which the British used India as a drain of wealth. A plaque referring to Dadabhai Naoroji is located outside the Finsbury Town Hall on Rosebery Avenue, London. C. L. Parekh, ed., Essays, Speeches, Addresses and Writings of the Honourable Dadabhai Naoroji, Bombay, Caxton Printing Works (1887). An excerpt, "The Benefits of British Rule", in a modernised text by J. S. Arkenberg, ed., on line at Paul Halsall, ed., Internet Modern History Sourcebook. Naoroji, Dadabhai (1861). The Parsee Religion. University of London. He made the first attempt to estimate national income of India in 1867. What's the good word on Dadabhai Naoroji?